A painting date night is an unforgettable Valentine’s date. It’s fun, unique, and romantic. And it includes amazing food and drinks! 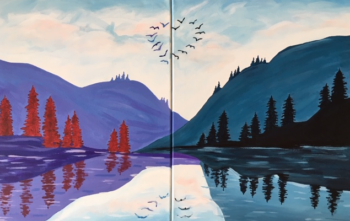 Our paint and sip studio is a fun and relaxed environment where a professional artist will walk you through the steps to paint a beautiful mountain scene (pictured below). No painting experience necessary, so there’s no excuses, guys! 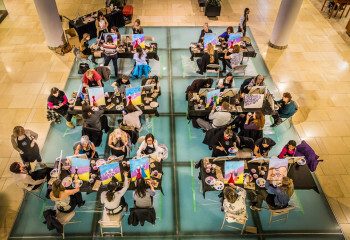 Your girl will love this creative date night, as a switch up to the regular routine. 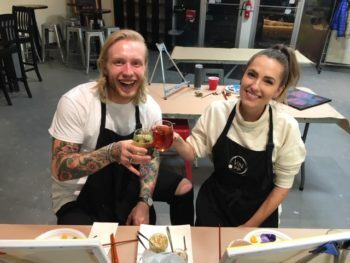 Whether it’s your first Valentine’s Day together, or your 50th, this couple’s date night is a creative experience like no other. You will start the night with a charcuterie board for two, followed by your choice of flatbread. Two drinks each (wine, beer, or other beverage). Fiasco gelato for dessert (we have salted caramel, chocolate salted caramel, and strawberry rhubarb Gelato). Each couple will receive a mason jar full of flowers to take home. 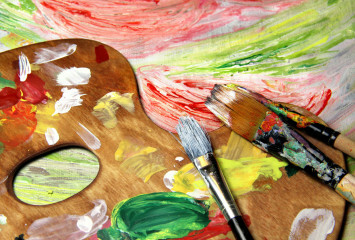 Paint a beautiful mountain scene to take home! Price is $169 per couple . Doors open at 5:30 pm. Please arrive by 6:30 pm to get your food and drink. Painting will begin at 7 pm. We really could not have made this date night any easier for you. Register today, bring your girl, and have a great time!